This article first appeared on the World Resources Institute’s website on 5 September, 2014 (see here). The shale gas revolution, which began nearly 10 years ago in the United States, is poised to spread across the globe. For many countries, shale gas could strengthen energy security while cutting emissions. But unlocking this massive resource comes with a significant environmental risk: access to freshwater for drinking, agriculture, and industrial use. Drilling and then hydraulic fracturing each shale gas well uses large volumes of water for short periods of time—between 7 million and 25 million liters (1.2 million and 6.6 million gallons). In September, WRI released Global Shale Development: Water Availability & and Business Risk, a first-of-its-kind report that raises a yellow flag: a series of water availability-related challenges could limit shale resource development on six continents. Three countries help tell the complex story: China, Argentina, and the United Kingdom. China is already the world’s largest energy producer and consumer. It has the world’s largest technically recoverable shale gas resources, but those resources are located in areas of highest water stress. 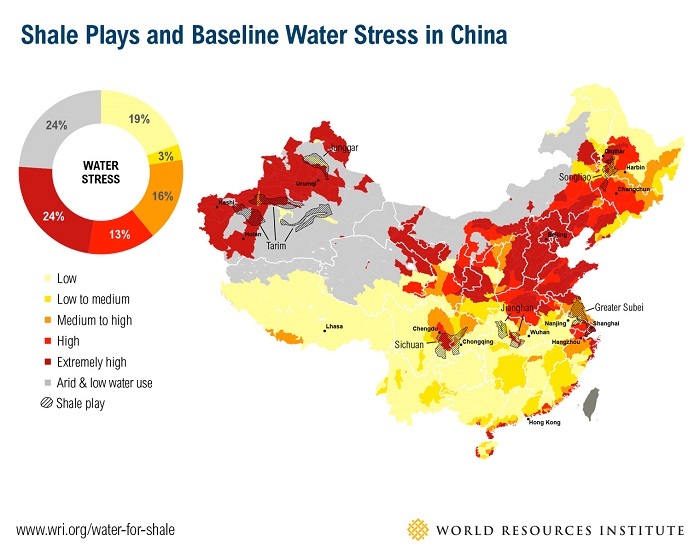 Over 60 percent of Chinese shale resources are in areas of high to extremely high baseline water stress or arid conditions. The government and energy companies are already grappling with the issue. In August, China’s two largest energy companies upgraded their forecasts for shale investments, even as the Chinese government halved its shale gas production targets earlier in August. As the world’s largest greenhouse gas emitter, the country’s shale resources could be a key to addressing climate change, but its water concerns must be addressed. Argentina is South America’s largest natural gas producer and consumer, and possesses the world’s second-largest technically recoverable shale gas resources. 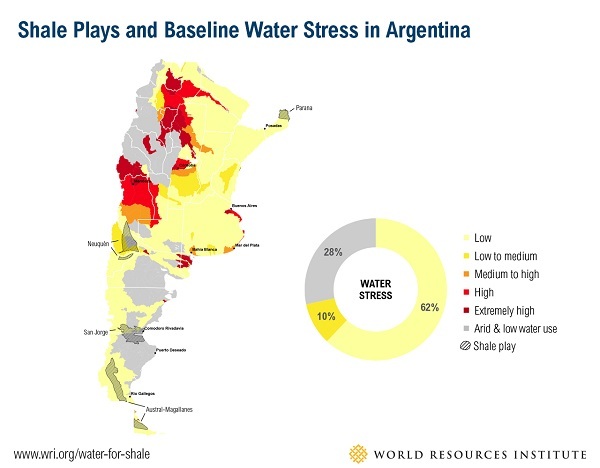 With low to medium stress over 72 percent of its shale resources, competition for water is less concerning to Argentinian plays overall. However, 28 percent of the resources are in arid areas, so the country will not entirely escape water-related constraints if shale development progresses. A partnership with Chevron helped more than triple production in a shale basin called the Neuquén from last year to this year. The U.K. is Europe’s third-largest natural gas producer. Industrial water use accounts for more than 30 percent of the nation’s total water demand, but those withdrawals have been shrinking for the past 10 years as natural gas and oil production declines. The government is now, however, offering tax breaks to boost shale development, and will need to manage water-related risks if shale drilling and hydraulic fracturing expands. 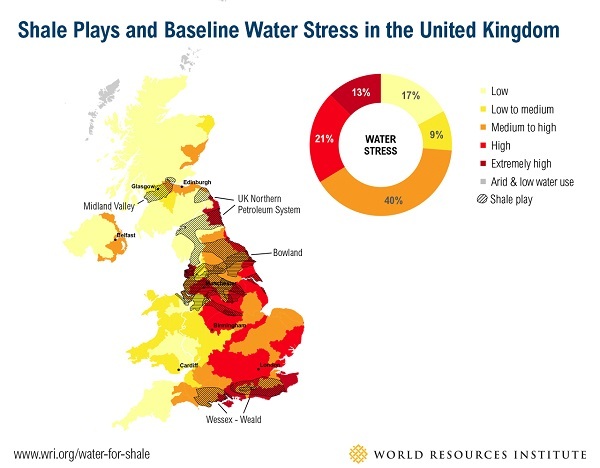 High industrial and domestic demands for water push 34 percent of the UK’s shale resources into high to extremely high water stress, making public concern and conflict around hydraulic fracturing more likely. In July, a report by two scientific groups cited widespread concern over hydraulic fracturing’s safety, so tension is already emerging. This water-shale energy trade off poses significant social, environmental and financial challenges. And over time, competition for water as well as public concerns over hydraulic fracturing will likely increase as shale development expands internationally and global temperature and precipitation patterns shift. Every country contemplating shale development will share a common concern for access to freshwater, but it’s important to consider the localized factors that make every well unique. 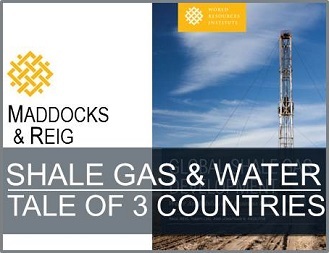 Global Shale Development also evaluates water availability for each shale play in 8 other countries either developing shale resources or most likely to develop them in the future: Algeria, Australia, Canada, Mexico, Poland, Saudi Arabia, South Africa, and the United States. Shale resource development is still nascent in most nations, making this the ideal time to take action. What can companies and governments do? Assess your water risks before deciding to develop shale plays to understand local water availability and reduce risk. Disclose all water-related information and work collaboratively with local regulators, communities and industries to build trust between all groups involved while reducing regulatory uncertainty and reputational risks. Engage businesses in public water policy processes, work collectively to protect the source of important water supplies, and develop water-management plans to help protect other users’ stable water supplies. Build a business case to minimize freshwater use and engage in corporate water stewardship to reduce impacts on water availability. A wide range of tools are available to minimize water use, including developing a water strategy and following water stewardship guidelines. To start assessing water-availability risks to shale plays in your country or portfolio, contact the Aqueduct team ([email protected]). Andrew is the lead on communications for Aqueduct, WRI’s tool for measuring and mapping water risks. He works to maximize the Aqueduct’s visibility and tell the project’s story to audiences ranging from businesses and investors to governments and international NGOs. See www.wri.org/aqueduct for more information, and read the team’s blog at http://aqueduct.wri.org/blog. Andrew previously worked in journalism and research institute communications. He has reported on global water, food, and energy issues for Circle of Blue, co-managed research, proposals, and outreach at the Woodrow Wilson Center, and researched journalism ethics for NPR’s ombudsman. Andrew holds a B.A. in conflict studies from DePauw University in Greencastle, Ind. Paul Reig is an Associate at the Markets and Enterprise Program. He leads the design and development of the Aqueduct Water Risk Atlas, WRI’s tool for measuring and mapping water risks. He also coordinates the working groups and companies charged with reviewing, road-testing, and applying the Aqueduct tool. Prior to joining WRI, Paul spent close to 4 years managing a wide range of water resources conservation and ecosystem restoration construction projects throughout the US States of Virginia, Maryland and North Carolina. Paul also spent time in Latin America working on environmental and social impact assessments for international energy and mining corporations. Paul grew up in Barcelona, and holds a Master in Integrated Water Resources Management from McGill University in Montreal, a BS and MS in Environmental and Agricultural Biology from the University of Navarra, in Pamplona, Spain, as well as a Certificate in Project Management from Georgetown University. Paul is an avid sailor and enjoys spending his free time on the water.